Dermarolling / Microneedling / Re: Using Different Sized Rollers? I think adding a 1.5 mm dermaroller to your routine is a good idea. If you roll and stamp in one session, it is usually easier to first stamp and then roll. If you first roll, the skin will get red and that will make the scars less visible to be targeted precisely by the stamp. In principle, you can add a 1 mm roller as well but I do not think it is necessary. Stamp just one cheek (or half of the cheek), when it heals, stamp the other, when it heals stamp the forehead (or half of the forehead), when it heals, stamp the temples etc. You can do it all in one session if you prefer but it takes a lot of time and patience to stamp the entire face thoroughly. You are stamping a large area so replace your stamp for a new one every now and then to ensure the needles are very sharp. It is unrealistic to achieve improvement of lines or wrinkles in two weeks. The lines around the lips need more targeted treatment. You should add a 1.5 mm dermastamp with 35 needles to your dermarolling sessions and stamp the lines. We recently added a size guide for various skin conditions to our dermarolling instructions. Dermarolling / Microneedling / Re: A-Ret cream 0.05% more creamy and oily? The active ingredient of our 0.025 % cream is Retinoic acid (tretinoin). -- Distilled water and cream base. Tretinoin initially makes the skin dry. This effect usually disappears or lessens with long term application. In general, the higher the percentage of Tretinoin, the more drying it is, initially. You have to moisturize a lot when using Tretinoin. For example, wet a cotton pad with tap water, add some almond oil and apply it to your face. If you are young, not prone to acne and no problems with spots or pigmentation, there is no reason applying Tretinoin creams on your face on regular basis. Dermarolling / Microneedling / Re: Small or large dermastamp for on my cheeks? The more the needles the more difficult it is to insert them (the so called fakir effect) and the less they penetrate. For serious acne scars, I recommend the smaller dermastamp with 35 needles. You do not have to stamp your entire face in one go. Stamp just one cheek, when it heals, stamp the other, when it heals stamp the forehead (or half of the forehead), when it heals, stamp the temples etc. The best is to combine a dermaroller and a dermastamp during one session. Stamp the scars and then roll the whole area. If you have scars only on your cheeks, you can also divide it into parts and stamp only one part during one session. I am not sure Infadolan can fully replace your ointment. It depends. If you are using an anti-inflammatory ointment now (even a non-steroidal one): Infadolan has no strong anti-inflammatory ingredient. Infadolan will help dryness and itchiness but I do not think it will affect the redness and pain (inflammation). It may have soothing effect on the skin and thus slightly reduce eczema flareups. Nobody knows what causes eczemas and that is why, instead of addressing the cause, they can only suppress the symptoms – such as the inflammation, dryness, itchiness etc. How eczema reacts to various creams is quite individual so you just have to try and let us know. In any case, Infadolan is suitable for dermatitis. Your microneedling routine should improve crepey skin eventually and I do not have any better advice than what you are already doing. 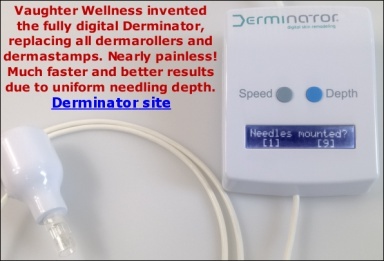 Dermarolling however does not improve every single skin problem in every single individual. I managed to nicely improve wrinkles around my lips and in between the eyebrows but my crow's feet have not improved almost at all. (We gave your forum posting a more descriptive title than your original title but you will find it). I will add to this later, but let me start by saying that I warn against any form of dermaneedling by an electrical device. These warnings appear in various places on our website, including our dermaneedling instructions. "However, we have to realize that if one did the deeper needling at the density of a tattoo, then the skin would be scarificed, and sure one would get a lot of collagen (in the form of scar tissue) and not a restoration of the complex elastin and collagen network which we aim to achieve with needling. However, deeper scars need greater penetration with the needle… …Even if the extra needling is done by hand with a single needle, this is well worthwhile doing". Could you please upload a better picture of the scars? The current one is blurred. I suggest using a 1.5 mm dermastamp but first try it several times on one of your spots to see what happens. You do not have to worry about it. The reaction will quickly pass and it will not spread. As I explained above, there is always some immune system reaction after dermarolling (the reaction is called inflammation) and in your case, the reaction is extremely strong but I am not even sure there is bacterial infection present. It may be present (not systemically though) and that is why I recommended Neosporin, just to be sure but even without Neosporin, your immune system will handle it easily. It is certainly not from the water. If you can drink something, you can surely clean the skin with it. I do not think the cotton pad could have been contaminated either, unless you kept them open right next to a toilet bowl. I have heard about a case or two when dermarolling triggered acne breakouts in acne-prone individuals but it is also very rare. Dermarolling / Microneedling / Re: Correct needle size for use on face? Thank you very much for your posting. It is important for us to hear about various experiences. We already know that what works for one individual does not automatically work for everybody but in many cases it does work for some. A test patch is always advisable. OK, in that case, apply on wet skin. It does not matter at all. The instructions regarding Retin A recommend application on dry skin because if it is applied on wet skin, it may irritate the skin more (redness, stinging) but this obviously does not apply in your case. Any time is OK and as many times a day as you need. You can even apply oil just before the Retin A application. Vitamin A is oil-soluble. Dermarolling / Microneedling / Re: Copper Peptide Serum as regular moisturizer? If your skin is not dry and you are relatively young (the skin tends to get drier with age), there is no reason to use a moisturizer every day. The skin should however be kept moisturized as much as possible after microneedling. Copper peptide serum is not a sufficient moisturizer after microneedling (the serum has no oily or fatty ingredient), especially not if you needle with long needles. You can for example wet a cotton pad with tap water, add some almond oil and apply it to your face. Keep the large container of almond oil in the fridge and refill a small one that you can keep in the bathroom. Oils are wonderful moisturizers because they form films to prevent water evaporation from the skin. Or use cocoa butter or any cream that is a bit heavier than a light moisturizer but it which does not cause breakouts with you (in case you are prone to acne). You do not have to wait. I am not aware I recommended waiting for ten minutes with the application unless you apply two different products and wait ten minutes for the first one to be absorbed or in case the skin is wet, you should wait and apply vit. A on dry skin. Can you please let me know where you found this on our website so that I can fix it? It is a very good idea to use it for eczema. Apply just a little; there is no need for heavy application. It will stay on your skin the entire day. Infadolan forms a semi-occlusive film on the skin which prevents water evaporation from the skin but the skin can still "breathe". Infadolan is indicated for cuts, 1st degree burns, dry skin, atopic dermatitis, for preventing diaper rash, for ulcers etc. Safe to use for babies.